In this post I would be discussing array reversal. 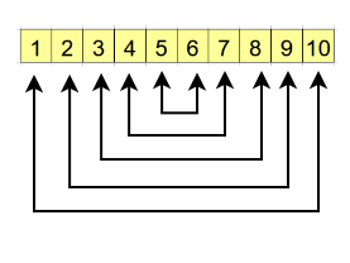 Array reversal means reversing the order of elements in an array. In the above Java program on array reversal the function displayArray() is a helper function to display the array. The displayArray function uses enhanced for loop which I have already discussed in an earlier post. The function reverseArrayIterative() accepts an integer array as an argument and returns the array after sorting as discussed above. Note that the function reverseArrayRecursive() is overloaded. The function which is public is the one which would be invoked for reversing the array. The function which is private would be invoked by the public function with the correct initial values. The private function would recursively call itself to reverse the array as discussed above. I would like to emphasize here, that iterative method of array reversal is more efficient due to time and memory overheads in case of recursion. This entry was posted in Code & Logic and tagged array, loop, recursion on March 30, 2014 by Vinay Singh.